'Atithi Guest House", which is situated half km from Bus Stand. The guesthouse is set in garden and is a good combination of a room in Village Style. The large and spacious rooms with attached big bath have been tastefully furnished in the traditional style. 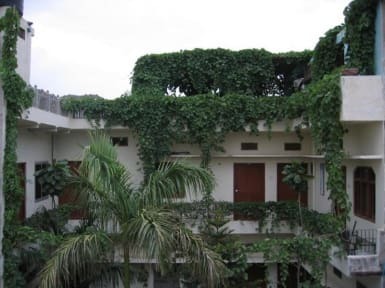 An interesting feature of the guesthouse is the fact that almost all the rooms over look the huge garden providing an artistic view of lush green lawns, flowers surrounded by mountains and sand dunes. Atithi Guest House aims to provide traditional hospitality to its valued guest. 'As the tempo of business goes down, the men folk turn to merriment, for the day of the camel sports is at hand. Camel races are the first event. Usually a lumbering beast of burden, the camel all decorated in finery, imagines itself to be an ostrich, and rushes through the race like one. Then comes the event analogous to musical chairs. Here, as the music stops, the camel is supposed to manage to stick its long arching neck between two poles, each camel owner guiding its entrant by means of a silken cord attached to its nose ring. We had great days here! The guesthouse is really good with wifi hot water and amazing rooftop to enjoy sunset. Totally recomended! I got a room, with hot shower, and nice bed (hard as normal bed in India for a hostal or guest house) but everything was clean. The owner Pappu was great, he will help you with what ever you need, in my case he help me to book the bus ticket to Delhi without any inconvenience. The only side downside is that there were not so much people to socialize, maybe because it's the end of the season but for the rest was great... also super good food and not expensive. Al llegar nos ofreció una habitación un poco mejor a la reservada sin costo extra. La comida es buena aunque solo sirven la cena y hasta las 21. El agua caliente no era posible para la ducha. El dueño muy amable dando consejos sobre la ciudad.